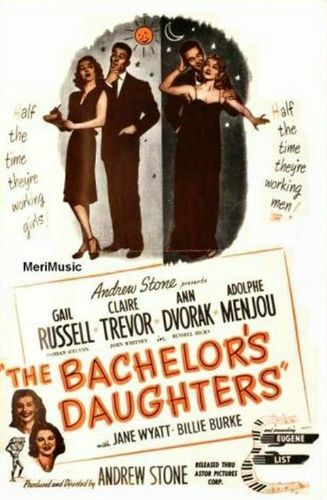 Andrew Stone's The Bachelor's Daughters has much of the nonsensical breeziness of Stone's earlier screwball comedy Hi Diddle Diddle; the stylistic link between the two properties is emphasized by the presence in both films of stars Adolphe Menjou and Billie Burke. The title characters are four merrily mercenary salesgirls: Eileen (Gail Russell), Terry (Ann Dvorak), Marta (Jane Wyatt) and Cynthia (Claire Trevor). Persuading distinguished-looking floorwalker Mr. Moody (Menjou) and shop assistant Molly (Burke) to pose as their wealthy parents, the girls rent a lavish Long Island mansion and pretend to be heiresses, for the express purpose of landing rich husbands. Eileen catches millionaire Bruce Farrington (John Whitney), Terry goes after Broadway impresario Diane (Russell Hicks), and Marta ends up with Schuyler Johson (played by famed concert pianist Eugene List), son of the owner of the store where she works. Only Cynthia fails in her mission, but there's still hope for her yet at the finale. In the process of snaring their mates, the bachelor's daughters learn the hard way that (all together now) Money Isn't Everything, while middle-aged Moody and Molly find true love without a price tag attached.